The goal of “Million Hearts for Haiti” is to sell 1 million hearts, and by doing so to raise $1 million for the HAND/EYE Fund Artisans Grants for Haiti program. But Williams wasn’t content to stop there. He presented the idea for “Million Hearts for Haiti” to his fellow HAND/EYE Fund artisan grants committee members and a program was born. Tesoros Trading donates the proceeds from Haitian heart sales to the HAND/EYE Fund. Tesoros was also instrumental in the HAND/EYE Fund booth at the 2010 Santa Fe International Folk Art market, which raised over $30,000 to help Haitian artisans. Seattle’s Greater Good Foundation donated over $20,000, as well. Grants monies have been already distributed to help with artisan feeding programs, to establish a raw materials bank for bead and sequin artists, to purchase sewing equipment, and more. 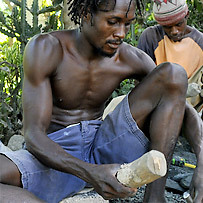 We are working directly with artisan groups to fill out the paperwork for future grants. Addressing basic needs is necessary in Haiti, so artisan housing and health are being addressed, as well as needs for materials, equipment, and design and marketing assistance. In Cormier, Tesoros’ new houses will be hurricane-proofed with HAND/EYE funds. We are also developing a matching funds program so that more artisans can earn new housing. Once an artisan saves $1500, HAND/EYE will match the monies, and a pre-fabricated house will be sent to Cormier and constructed. Jonathan is also developing a tool bank concept to help the carvers with better tools. Though Cormier is just a two-hour drive from the capitol, it is a world away in terms of lifestyle. The river that runs through the settlements that make up the village is broad and clean. The woods high up on the riverbanks are tranquil. Preserving jobs in these rural locations means that the men and women of Cormier can stay put and earn decent livings, rather than move to crowded Port au Prince, where approximately 35% percent of the Haitian population already lives. Many rural Haitians are nonetheless forced to move when their hometown shows zero promise of cash income. If you want to help make a difference, buy some stone hearts through Tesoros Trading, or donate to the HAND/EYE Fund. Fill someone's bucket with love. Remind your loved ones why you chose them to be yours this Valentines Day. Moomah the Magazine is just what I expected from the creativity minds at Moomah. A simply beautiful format is easy on the eys, easy to nativigate. Thank you for continuing Moomah.